Has finding support for your IBM i (iSeries, System i & AS/400) become a challenge for you? Are you struggling to reduce your costs while trying to improve operational efficiencies? Do you find it challenging to manage your midrange systems? Are you considering outsourcing your IBM i (iSeries, System i & AS/400) in order to gain additional support and reduce your operating costs? If so, we can help you to look at the costs and risks of outsourcing. We can also help you find qualified vendors to manage your systems. The IBM i (iSeries, System i & AS/400) sourcing models comes in three major flavors. Each of these scenarios has its pros and cons. In a traditional outsourcing engagement a vendor will migrate your IBM i (iSeries, System i & AS/400) to their data center; either to a “like” system or a dedicated LPAR. A vendor will then provide all the operational and system support needed to maintain your systems. They will take care of support functionality such as upgrades, patches and fixes. They will also provide all the environment requirements (electricity, HVAC, security, etc.) and they will usually provide disaster recovery support services. This type of outsourcing generally leads to the biggest cost savings as a vendor is able to provide the most leverage. Is this scenario, you will keep the hardware (iSeries, System i & AS/400) in your data center. The vendor will then provide the remote operational or system support for your environment. The vendor can provide you with almost the same level of support as the outsourcing model but with some limitations. They can’t physically mount tapes, they usually don’t provide offsite storage or disaster recovery services and they can’t leverage as much cost savings. This scenario is not implemented as much because it tends to be, at least initially, the highest cost model. In this scenario the vendor will re-hire your employees or place their employees in your data center with a bulk of the work being done on site. These are the three most common models on IBM i (iSeries, System i & AS/400) outsourcing. However, we are seeing more and more clients use a “blended” approach to outsourcing. The engagement might start out as a facilities or remote management engagement in the early years and move toward an outsourcing model in the later years. This usually happens after the client and vendor have established a mutual trust. 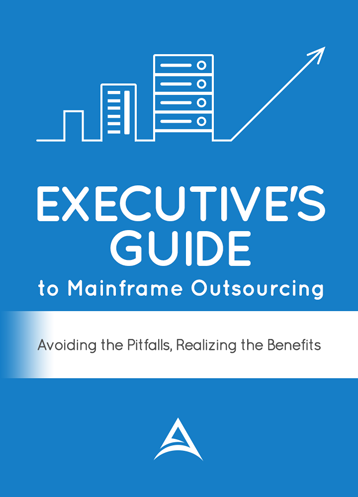 For more information on IBM i (iSeries, System i & AS/400) outsourcing download our Executives Guide To Outsourcing.